Why the 2009 Lincoln MKS? Feels like my finest leather couch in the rear and the room of a Town Car. The largeness. The Technology is the BEST available. Heated & cooled front seats Heated rear seats. THE quietest car of all I have driven...until I accelerate heavily. Laminated front AND side glass. Thickest ever in a car.. This the best point of this car. The leather, from Scotland, is the best I have experienced in a car... And the room is such that my 6 foot son feels separate from me when along for the drive. Although told was soft in turns, unless you are a bootlegger, I have no idea what the worry and talk was all about. It drove like I was always in control. 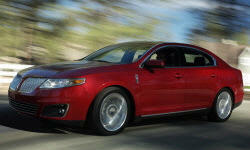 Why Not the 2009 Lincoln MKS? Hmmm...here is the soft under belly of the car. Although my (better off) friends chuckle at my complaint, I have always driven cars that gave me better mpg. But, the size and the luxury seem to wash this issue away. Each time I tell someone I actually purchased a Lincoln, I have to start defending the decision all over again. It seems I have sold out and admitted I am ...old. I would be more successful describing color to a dog. I guess the depreciation has everything to do with the fact that my family and friends think I have admitted I am now an old man. BUT until they actually experience the car, both in seeing it and driving it, this effect on depreciation will continue.